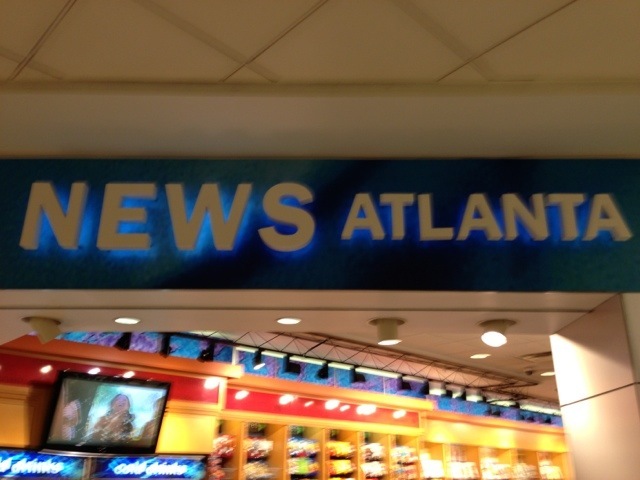 I made it through the Atlanta airport without buying any books. That is a huge feat and an accomplishment. I love books (especially cookbooks). But books are heavy and cumbersome. Storing them hardly pays and make little sense. Just to give scope of my “book” struggle, I believe thirty banker boxes were given to my “Outlaw” to sell on Amazon. We were going to put them in a garage sale but she convinced us they would make more money selling online. Well, she was right, and has now sold over $1,000 dollars!!!! That’s in used books, my used books. Amazing. Just think how many I had……. So how did I go cold turkey? I didn’t. I went to the library and got a library card, then downloaded books to my iPad. Also online magazines, and books from Amazon. All digital. I am packing 2 digital library books, 5 kindle books, and 8 digital magazines. How awesome is that? If I can’t get it digital then I hold off. I hold off for weeks (now months) and truly debate if I want a hard copy for a book. No suffering here, I’ve gone digital!!!!! Yes, there is a struggle about not having a book in hand, however it is nice to have digital spread amongst my devices. Highlighting and searching them is easy. I think I’m a digital convert. 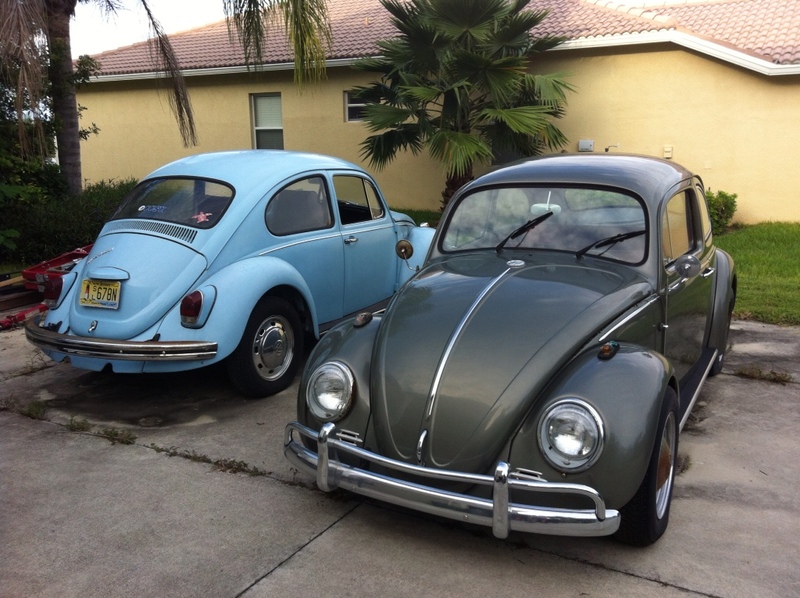 Time will tell……..
Just sold my two VW’s. They were meant to be working projects to do with the kids. In a cruel twist of fate both engines blew up while driving home for the first time. The grey was bought in 06, drove it from Ohio to upstate Florida (the engine blew). 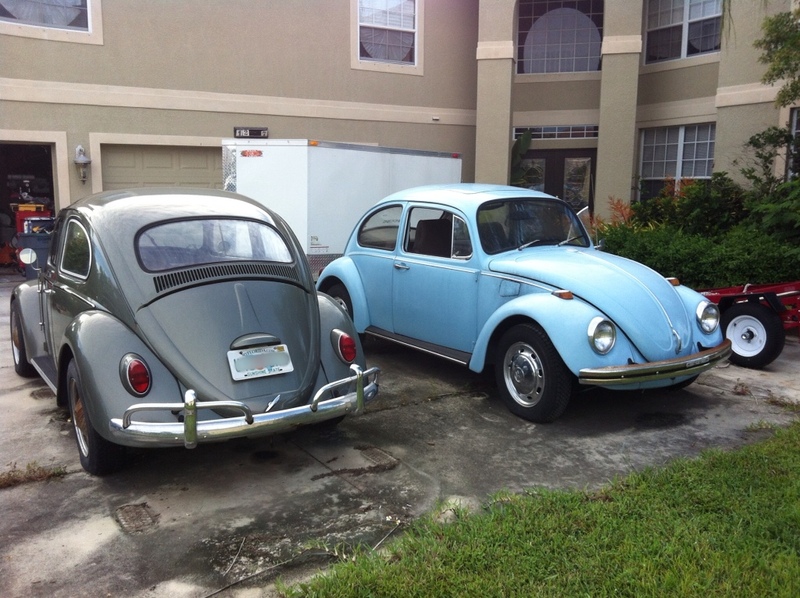 Then the baby-blue was bought in 2011 in Tampa FL and blew 30 min from home. I have not had good luck with VW’s to say the least. They have sat awaiting engine work and the time to do it. Seth was sentimental to the grey, Brooke to the baby-blue. I tried to sell the grey a few years ago, it brought tears to Seth, so I kept it. Brooke dreamed about driving the blue upon turning 16. Now with fulltime RVing on the horizon it was time to sell. This time, no tears from the kids. They have accepted change and that it’s time to let go. So punch bug, no tag back!!!!! Oh man, it seems like I “broke” Google Maps. Basically for the past month and a half I have been starring my google map when I find something interesting to do or see (National Parks, State Parks, Campgrounds, Fun Attractions, Learning Experiences, Historic Places, Roadside Attractions). You know, fun road stuff. If I read about some place in a blog, book, magazine – I put a star on my map. If I come upon a list – battle grounds, fossil parks, best waterfalls, outdoor places, best places to eat – I put stars on the places. Now I don’t think I will ever visit (or would want to) all of these places. They are more or less interesting places in a region/state/city. If we happen to be in the area, then we will look at the offerings. Then based on time and interest, we might do it. The grand plan was to keep starring the map, and then use it as a future travel resource. Simple. I was working on a fossil park list and noticed Dinosaur National Monument was not starred on my map (I had done that one about a month ago). Upon further investigation I found that a lot of my earlier maps stars had fallen off!! Thinking I reached some “star-threshold” (I am at over 1,000 map stars), I started to research the problem. Results, nothing, nada, no cited problem. I then opened a post in the Google Map Forums, and guess what, Google responded. They have not seen this behavior and are now investigating. I “broke” Google Maps – how awesome is that !!! 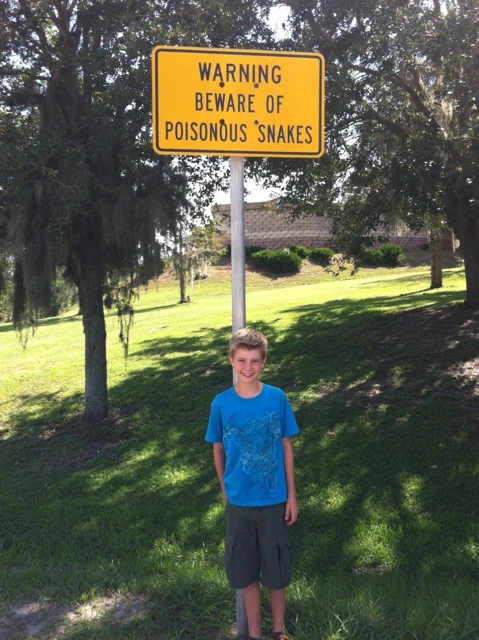 Seth and I were traveling south of Gainesville. 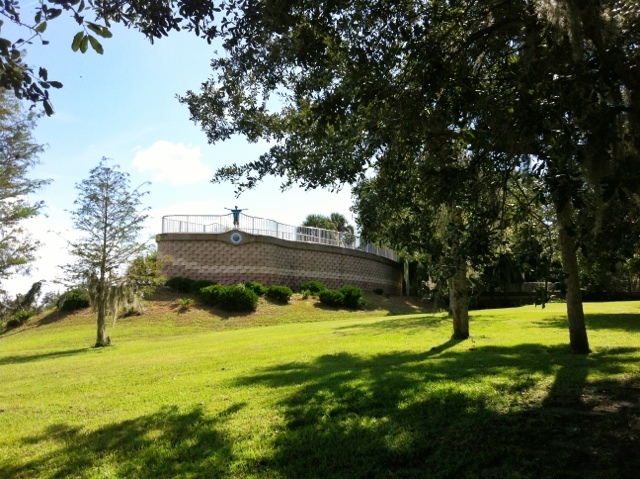 At a southbound I-75 reststop is an overlook in the shape of a snake. You walk up its curvy back to its head that is pointing toward Payne’s Prairie State Park (which is a savannah). Somebody has a sense of humor. The last parking space has a sign warning of poisonous snakes. That really tickles me. 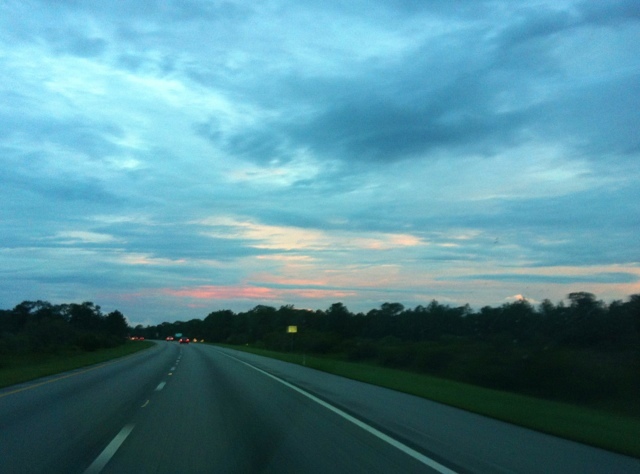 Picture of a beautiful sky while driving home. 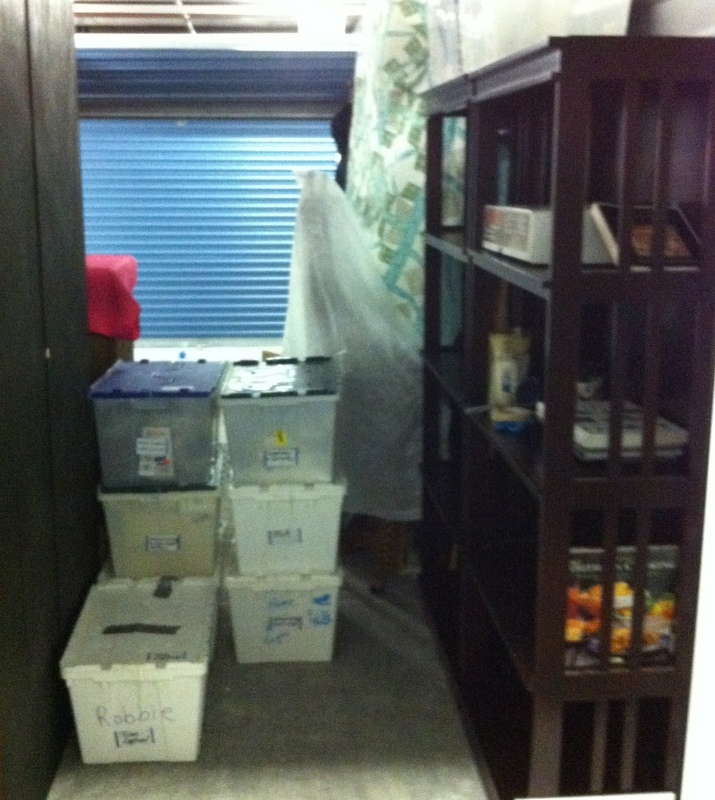 We are making adjustments to our storage unit. Moving out of smaller ones and consolidating into a larger one. We have dived up the space (furniture, educational/homeschool, kids, wife, and mine). My space (which is equal to wife’s, but she also has homeschool stuff in hers) is a 5X6 space. It has bookshelves on ones side, to store books and “stuff” I may need in the future and space for 32 plastic tote containers. At first I can’t believe that my life is reducing to a 5X6 space, but then when you consider 32 containers, that just sounds like a lot. I do know that I have been getting rid of a lot of junk/stuff. Currently I seem to be keeping – hobby stuff (wood carving, electronics, BSA), Books (southern cooking, BBQ, and crock-pot (RV cooking? ), and sentimental/keepsakes. When I’m finally done I’ll post the final inventory by category. Moving or downsizing might be making my brain punchy. I keep thinking about the numbers. 5X6 – the only thing I can think of is the size of a prison cell – wrong, looked it up (average size US prison cell is 6X8). 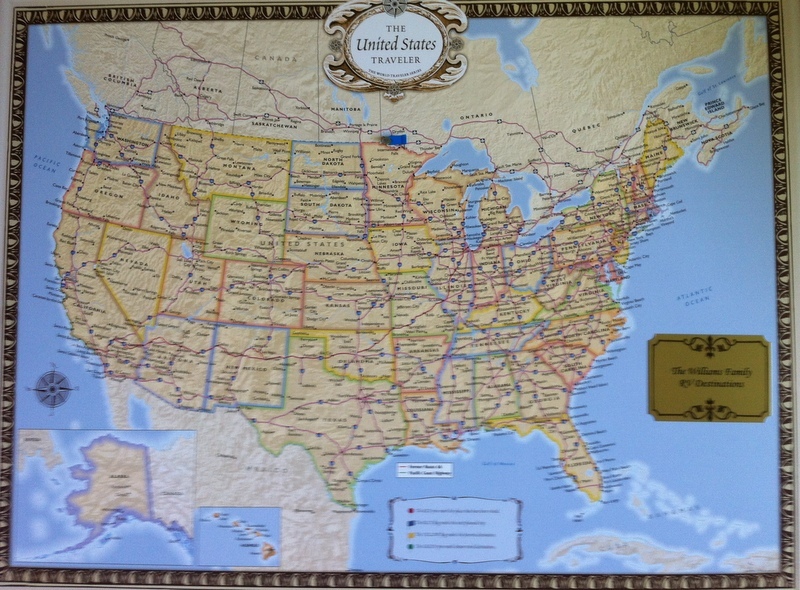 Put a pin in the map, now it serious…..
For my birthday MJ and the kids, gave me a framed map of the US to place map pins (where we are going, where we have been, where we would like to go). Included is a blue flag for destination. This wasn’t a hard choice as Seth will be going there during the summer of 2013 to do a “boundary waters” canoe trip with his Troop. 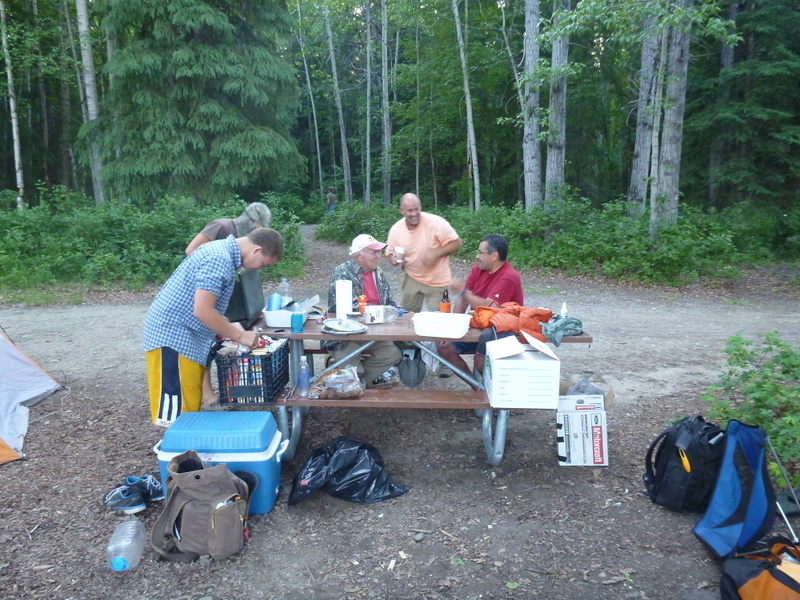 MJ has also “talked” the troop scoutmaster (Fuzzy) into “allowing” a family canoe contingent (think MJ, Brooke, and Scout) to also go on this high adventure trip. So it really wasn’t a hard choice at all. We will “winter” here in Fort Myers, then sometime in April/May we will start to mosey up to Minnesota. That’s the plan. Now *if* we were really cool (which we are), I would try to go down to Everglades National Park (Flamingo, FL), then go to Voyageurs NP. So my Alaskan pal (native Alaskan by the way) Lonny called and left a voice message concerned that we had wind storms here in south Florida (Tropical Storm Issac) and if we were ok. We did have some wind, and rain squalls, but all was fine on the home front. Nice that he called checking in on us. Lonny tells great stories about living in Alaska. 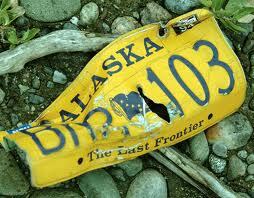 Fishing, hunting, camping, all the best kinds of stories, alaskan-style. Seth loved hearing him tell about how to catch King Salmon (with down riggers on the ocean). My favorite were his moose stories, shooting, gutting, quartering, watching out for bears….. The best storyline was this “you know the easiest part of hunting a moose is pulling the trigger…. after that its all hard work”. His wife was great. She had seven “guests” show up and didn’t miss a beat. Their kids are wonderful (smart, polite, active), and did I mention homeschooled!!! It truly was wonderful, and a blessing being with them. 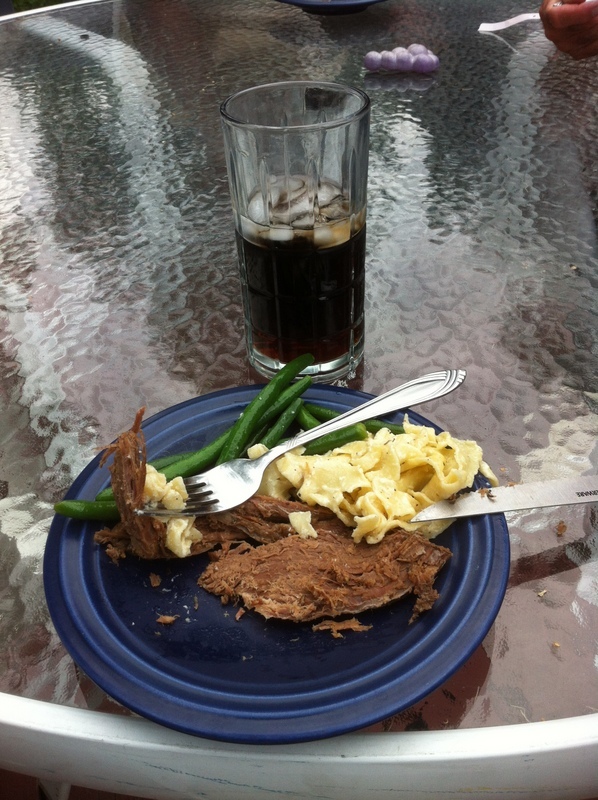 Eating moose, being with an Alaskan homeschooled family, hearing great Alaskan stories, it was perfect. 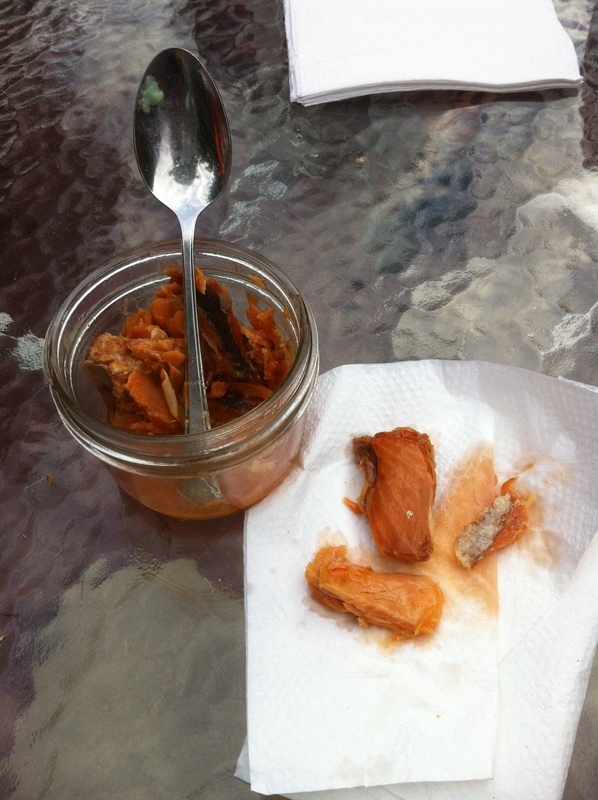 Lonny even got me to try canned/jarred salmon. So Lonny talked me into it…… He tells me how its carefully hand-crafted by a friend. That the guy somehow packs the fish in tight, that its firm, smoked, great flavor, “the best that you will ever have”. How can you resist that? Lonny, a descendant from Eskimos is asking me, while in his home, at his table, to try something new *and* he is certifying that it will be the best that I will ever have….. Ok, color me there. I’m in. (hope I don’t have to visit a hospital during the night, hope I don’t have to get medevac from Alaska to Florida, hope Karma isn’t against me on this one). So I tried it. Canned fish (of all things). It…. was… awesome…. ummm, it was so good. Smokey, spicy, firm texture…. It was everything I was hoping it would be and much, much more. Thats the good part, the bad part is I am sure I had just the best, its all downhill from here, everything else will be a sad imitation. (unless I go back to Alaska for more (if Lonny is willing to share)). By-the-way, Lonny didn’t send me home with any. Whats up with that? 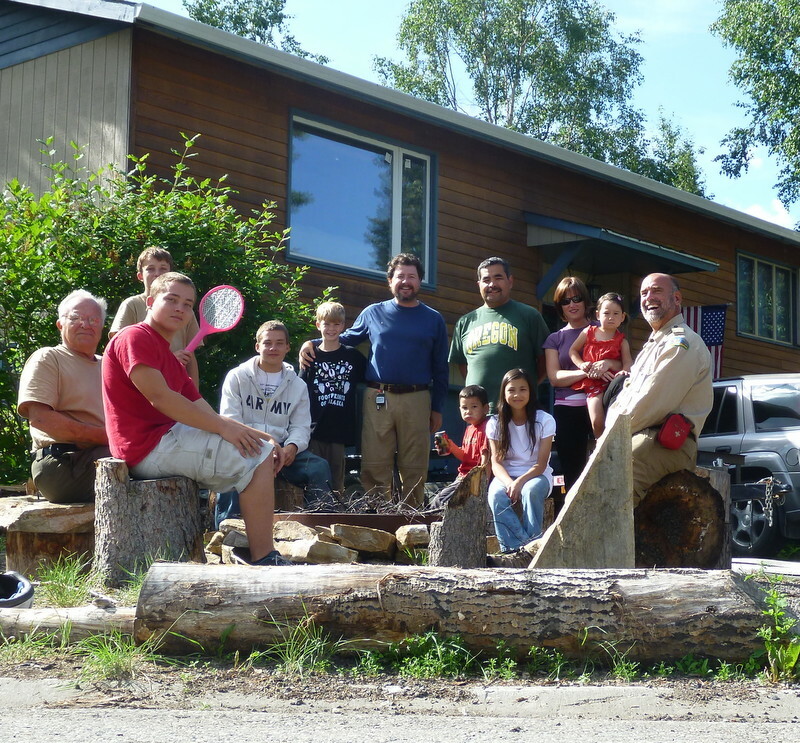 Being with Lonny and his family was one of the highlights of our trip. I can’t wait to go back during the season and being able to spend more time with him and his family. I know the wives and children will get along great, and hope to have some grand outdoor adventures with them (they truly are a great family). Now, here is the part of the story that I have left out (until now). Lonny is a high-ranking official in the Alaskan State Troopers!!! He’s the Fuzz, Po-Po, the Five-Oh. He’s the dude you want covering your back (knowing he’s the dude that will run in front). He’s the man (and I mean the M-A-N). Geeze, I’m hoping come the season of 2014 there isn’t a BOLO (or warrant) out for the Williams Family!!!! “Sir, can you please step out of the RV, seems like your wanted in Fairbanks for questioning”….. So Alaska had some high wind storms that cause flooding and knocked out power for a few days (this is during the summer, not winter). So I got to call Lonny to so if he was “ok”. Hows that for a twist, a turn, and a laugh. I got a text back from him. Man, I can’t wait to get back to Alaska.